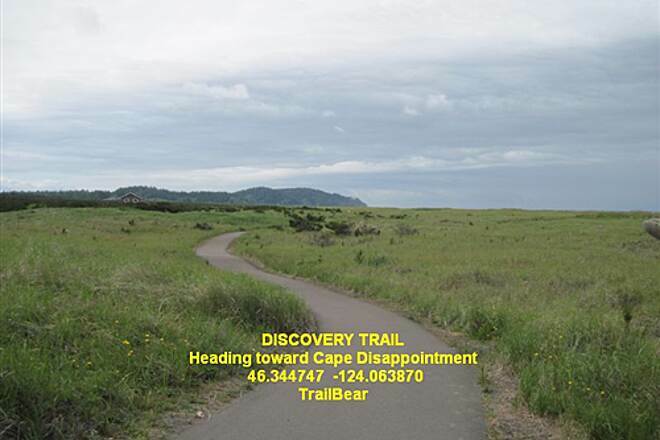 The Discovery Trail is one of the most scenic in the Pacific Northwest with outstanding views of the ocean, grassy dunes and forest groves. 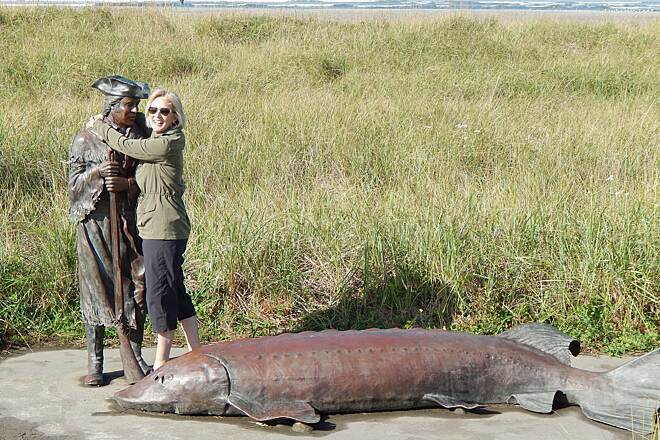 As it's named for Lewis and Clark’s explorative trek here more than 200 years ago, you'll find several bronze sculptures along the path that commemorate the expedition. 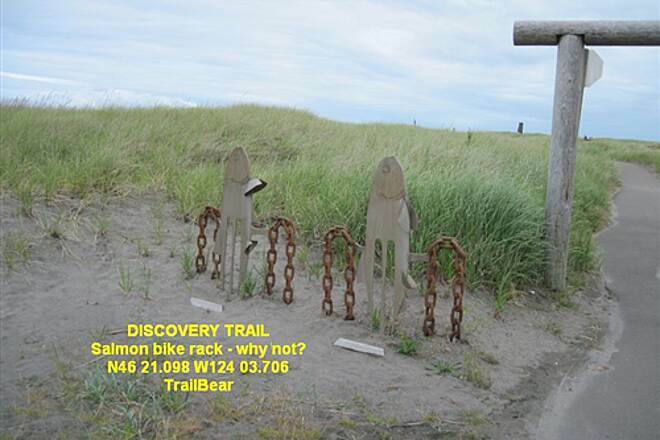 But the trail offers a collection of other impressive public art as well that adds to the trail's natural beauty. You may also be lucky enough to see deer, bald eagles, shorebirds and other wildlife on your journey. 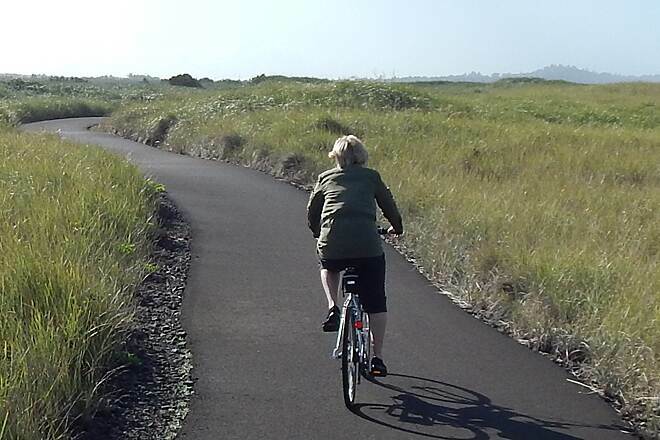 From the trail's northern terminus in Long Beach, you'll travel south along the coast, at one point paralleling the city's extensive wooden boardwalk from Bolstad Street to Sid Snyder Drive. 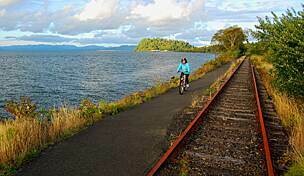 Continue along through the quaint town of Seaview; when the trail approaches N. Head Road, it forks. 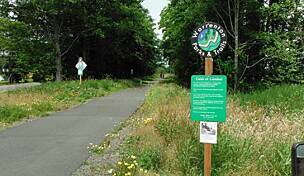 Head northeast at the fork and the trail becomes forested, soon turning almost due east and ending at the historical fishing village of Ilwaco. 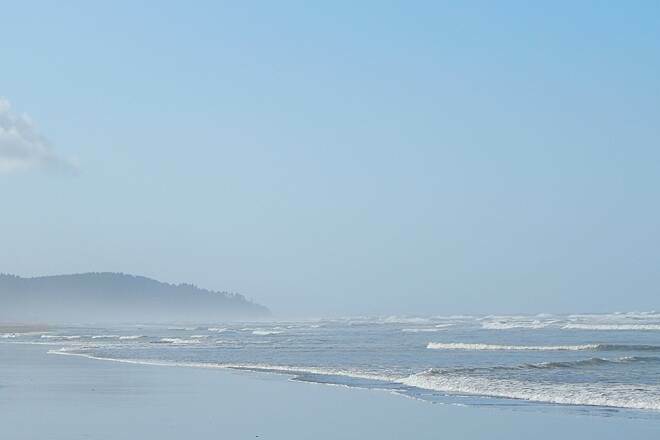 Head south at the fork to enter Cape Disappointment and enjoy the state park’s beaches, hiking trails and two lighthouses (both more than 100 years old). The ocean overlook at Beard's Hollow is especially worth a look. 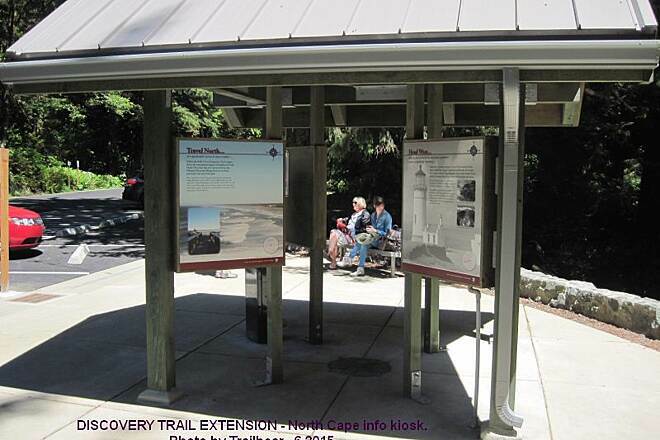 You can also learn about the history of the area at the park's Lewis and Clark Interpretive Center. From Pacific Highway/State Route 103 in Long Beach, turn west onto 10th Street S./Sid Snyder Drive and continue 0.2 miles to the beach parking lot. You can also find a large beach parking lot at the end of Bolstad Street. 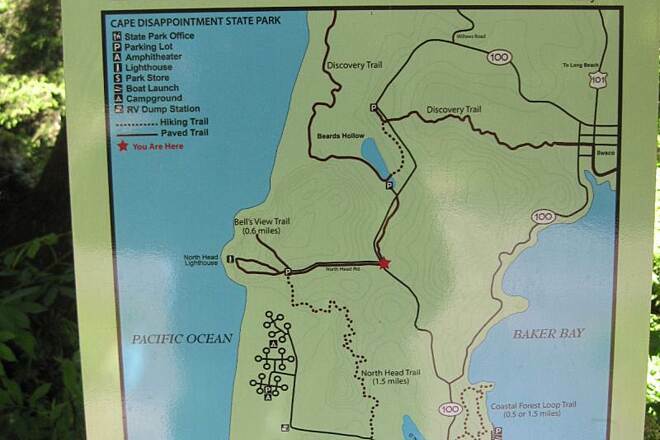 In Cape Disappointment State Park, you can park at the lot at Beard's Hollow. Beautiful morning ride. We started at 26th N. The farthest point north. The hotel there provides complimentary parking. Spectacular baby rollercoaster ride for 6.35 miles to Beard's Hollow. Got a little confusing there because the trail was gravel and steep after the bridge. We went back and found the trail to the lighthouse. Very Nice. Got directions from the park volunteer. 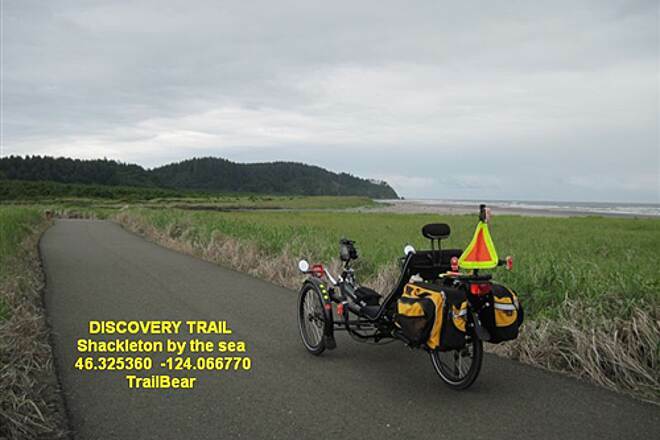 We went back to the road, turned right up the hill and found the asphalt trail to Ilwaco. It was wet and slippery from fallen leaves. Control your decent carefully! 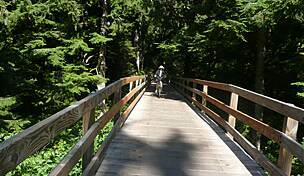 My wife fell hard on the wooden bridge just before the end near Ilwaco. The bridge has "SLIPPERY WHEN WET" sign. IT IS!!! We walked the bridge on the way back. The next day we rode the dunes section again because it's absolutely gorgeous and not crowded on Monday. 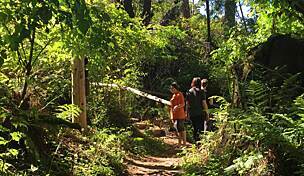 This is a great forested section of trail that is beautiful and fun! As noted in other posts, it includes some ups and downs, and it is definitely worth checking out. 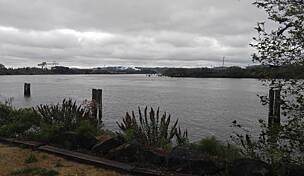 during the summer, consider combining your walk/hike with a visit to the Saturday farmer's market at the Ilwaco waterfront, where the trailhead is located. 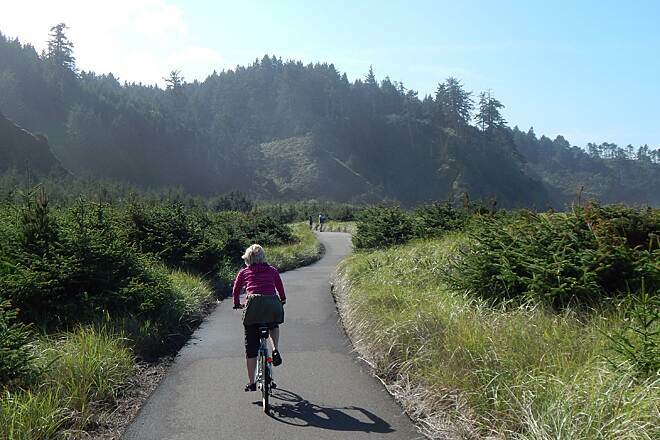 When the Trail turns to Ilwaco it is not paved and very steep, up and down and up and down. The rest of free trail was beautiful and fun. We had a great time on this trail. My husband and I camped at a nearby campground for the weekend with our 2.5 and 4 year old. My four year old had a bike trailer (the tandem kind) connected to mine, and she loved it. It was her first time using it, and she did a great job. This trail was really easy to do this. My husband pulled a bike trailer with my 2 year old inside. When my daughter did get tired, she hopped in and took a nap. We started at the end in Long Beach and rode to Beard's Hollow. At that point, we had to walk the bikes to the top of the hill (maybe 1/2 to 1/4 mile) because it was too steep for us. We explored the grounds of the Northern Light House, and stopped there to eat out picnic food. We did not venture into Ilwaca as that trail seemed quite steep. The ride back to the starting point was great. 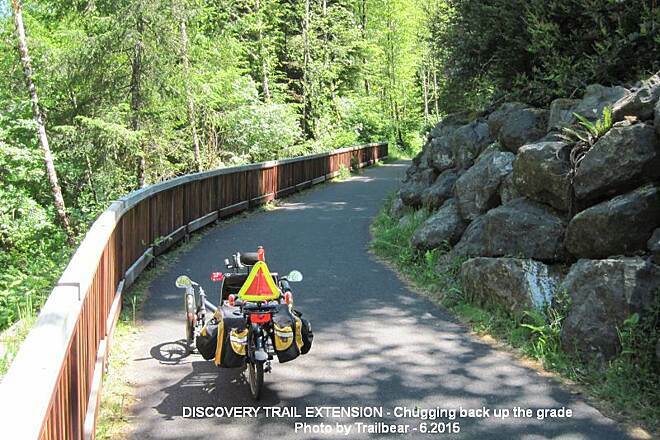 I would recommend this trail for families. Very beautiful ride! Been several times. Weather can be unpredictable. Wonderful ride. Beach grass, sand, trees, art, cliffs, bathrooms and ice cream at the north end. 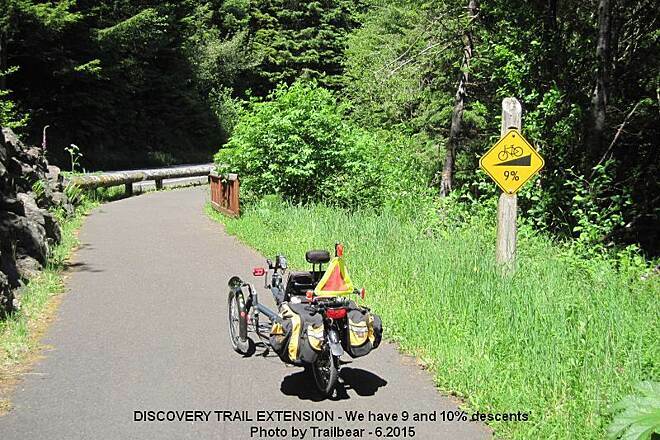 For full and accurate review, read Trail Bear. 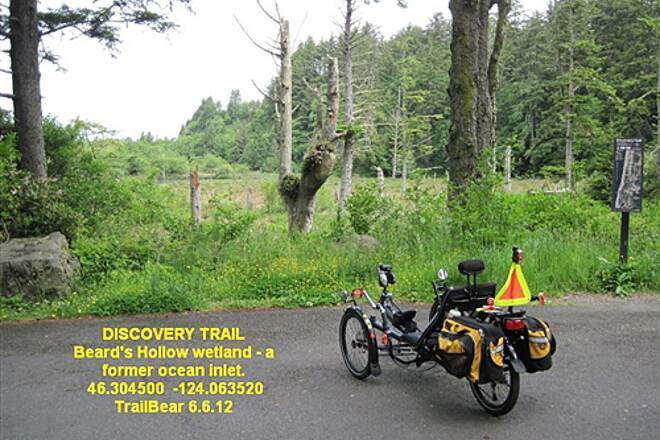 200 yards from our Thousad Trails campsite the trail takes us North through undulating sand with flowing grass hair. The path curls into the sand pines then faces toward the breaking surf. Many places to go down to the Pacific Ocean. Northward the path, always winding, takes you through Beards Hollow climbing up to the North Head Cliffs and light house. Seaview and Long Beach WA and environs are full if good eating and fun things to do like razor clamming. Beautiful day for February. The sun was out, very little wind and the trail was not crowded. 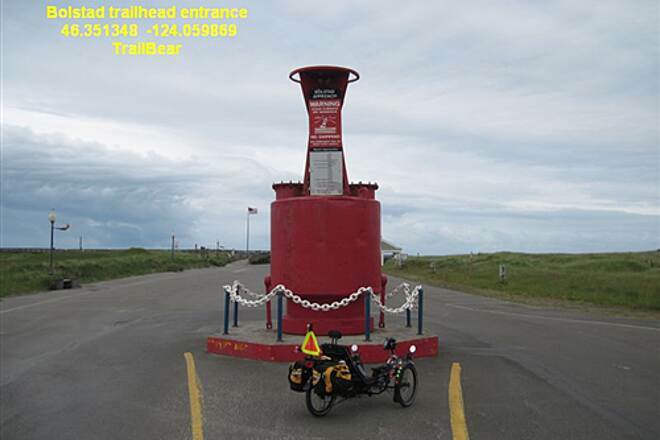 We started out at 10AM on mountain bikes from The Breakers motel located at the northern terminus of the trail. Smooth black top on gentle rolling sand dunes made for a pleasant, leisurely day. Most of the trail is behind the dunes so the ocean can always be heard but only seen in a few open spots as you head south towards the landmark point easily seen looming about six miles away. 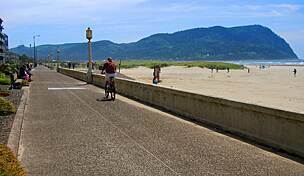 We made it to the graveled hillside that drops into the the town of Ilwaco. On the way back we decided to take the bikes onto the beach for several miles and then pop back onto the trail. There are plenty of paths leading to the beach from the paved trail. I cant think of a better way to spend a day with the ocean breeze on one side and the sea of dune grass on the other side. Plenty of places to stop and sit on convenient benches. This would be a great place to take the kids. The trail is so undemanding and easy, anyone do it round trip in about three hours. Four hours if you smell the roses along the way. Nice, smooth ride. Meandering through the dunes with peeks at the ocean. Up and downs but easy with momentum. We only did about 6 miles (round trip) looking forward to going back and doing the whole thing. 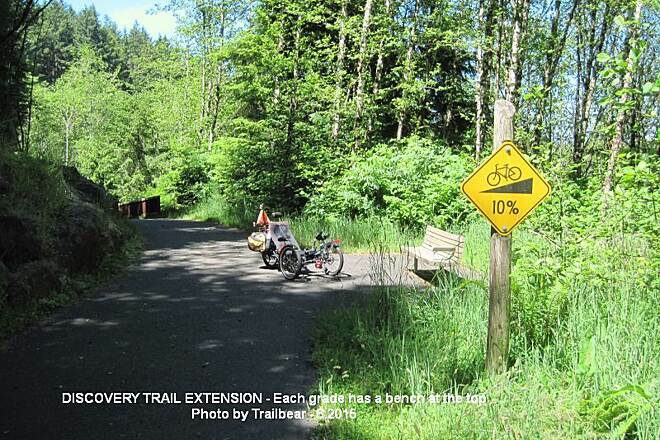 If you are out on the coast where the Columbia River meets the Pacific, give this trail a ride. You’ll like it. What is not to like? It has views, public art at intervals, benches, restrooms, water, parking, smooth blacktop, a trail that twists and turns and rises and falls as it traverses the dunes to Beard’s Hollow – a wetland that was former ocean. (How did that happen?). 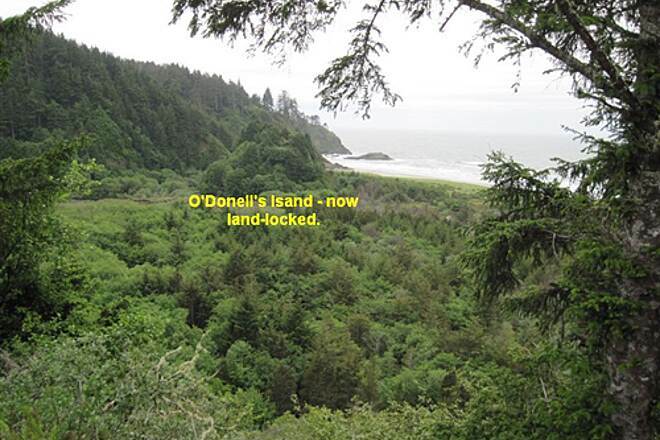 If you want more, you can climb over the spine of Cape Disappointment and down to the little fishing town of Illawaco. 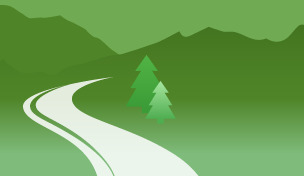 The Trail: One lane blacktop, un-striped. Good quality and smooth. No cracks seen. It goes over the dunes, rising and falling with them. Some of the inclines are over ten percent, but short. Lots of curves for interesting riding. Blind curves for even more interesting riding. Use your horn. 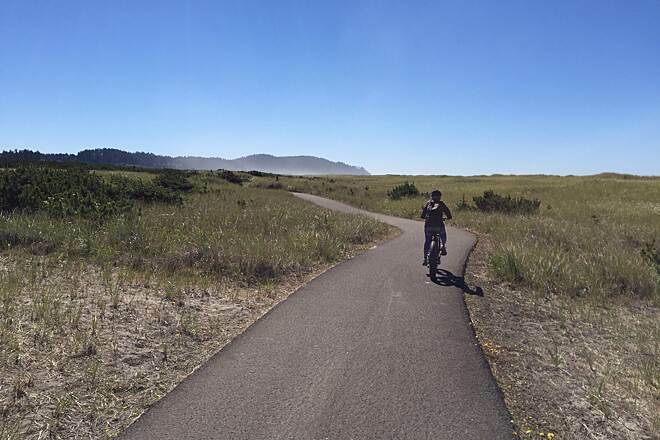 There are six trailheads on spur roads into the dunes along the beach section, plus a trailhead at Beard’s Hollow and parking over in Illawaco. Bolstad St. is the biggest one with lots of parking and full facilities. 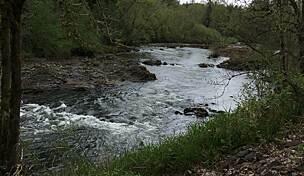 On a sunny summer’s day (and we have several each season in the NorthWet), there may be competition for space here. With a storm moving on shore, I had one eye on the clouds riding the brisk wind up from the south and the rain showers offshore and one on the trail. There is nothing quite like having the skies open when you are at the far end of a trail. This is more fun on a recumbent trike. On a trike you have a lap that gathers water and have to bail it out. 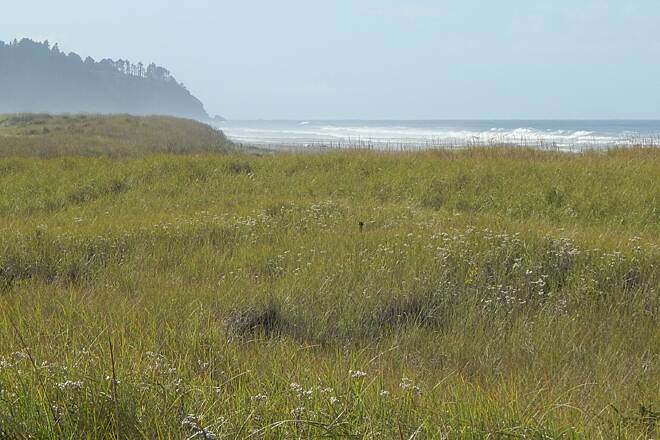 The central theme of this trail is dune grass: Miles of dune grass; a sea of dune grass. As you rise and fall, it’s like sailing on a sea of grass. The ocean is behind the first dune, but the roar of the surf rides with you. This is not an ocean ride. You are on the deflation plain behind the first dune. You see miles of grass. The ocean is mainly seen at the trailheads where the roads punch through the dunes. Bolstad St. was the trailhead of choice. There are direction signs out on the main drag to point the way. 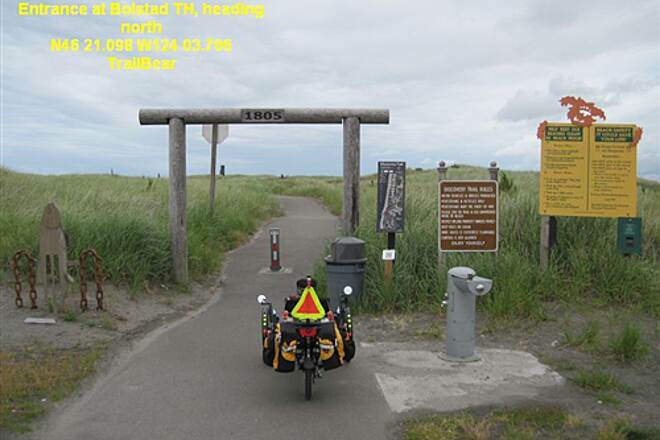 This is the main trailhead on the dunes section. Starting here I could ride the majority of the dunes and get up to Beard Hollow on the south end. 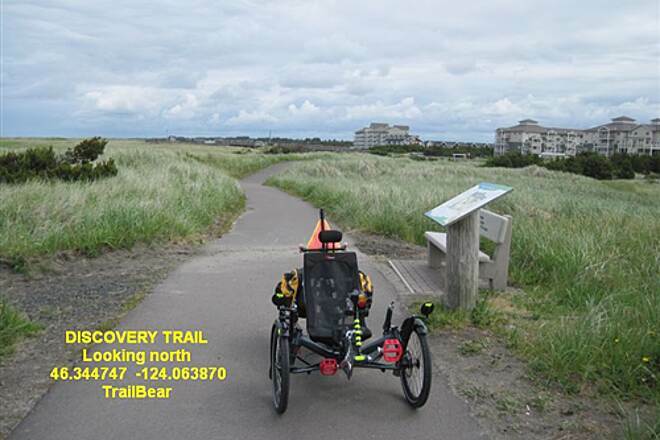 Scamper back and – weather permitting – do the north end of the dunes. 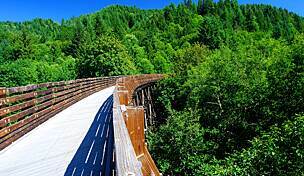 For the walkers, there are options: Trail walking, beach walking or a nice timber boardwalk south to the next trailhead at 10th St. For drivers – try the beach. We saw cars driving along out there. 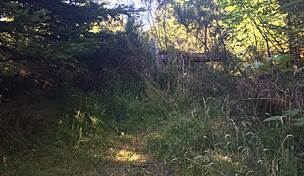 The first challenge at Bolstad is getting onto the trail. There is a short and steep ramp up. Give it a try, back down, round the parking lot, shift into granny low (12 GI) and go for it at speed. Up and over. 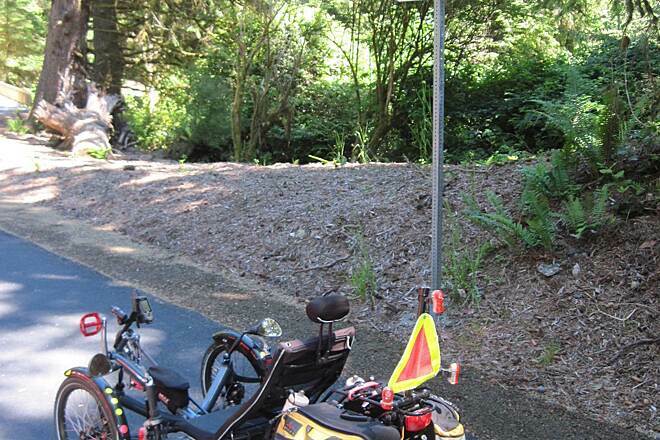 (Remember, trikers cannot stand on the pedals. Up, down or sideways, its pedal or push.). 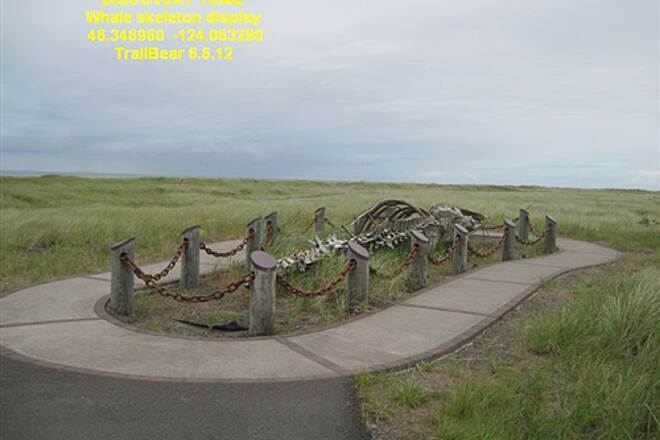 The first trailside exhibit is at the south end of the boardwalk: a grey whale skeleton. 10th St. S has something seldom seen – a restroom dug into the dunes. Earth sheltered and all that. 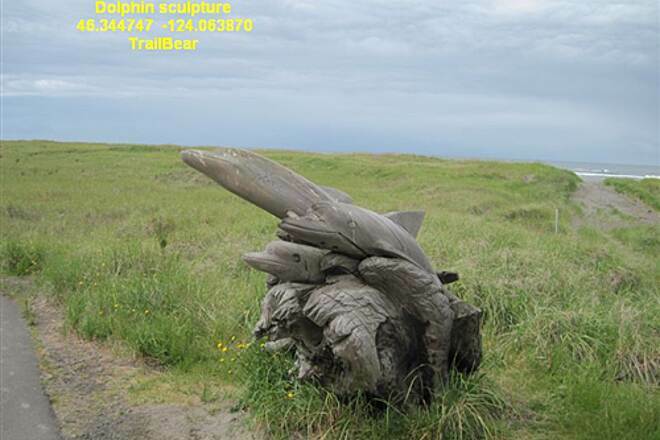 Just below 10th is a fine set of wooden dolphins on display. Twist and turn through the pines and suddenly the trail enters a cleft with a rocky cliff to the left and the bulk of the cape to the right. Herein a story: The sea used to break on the rocks you are pedaling by. That cliff is one side of O’Donell Island. Behind it is Beard Hollow, now a full time pocket of swamp but Back The it was an inlet of the ocean. What happened? About a century ago they built the jetty and the migration of sand was stopped. Dunes formed. The inlet was cut off from the sea. A swamp formed. 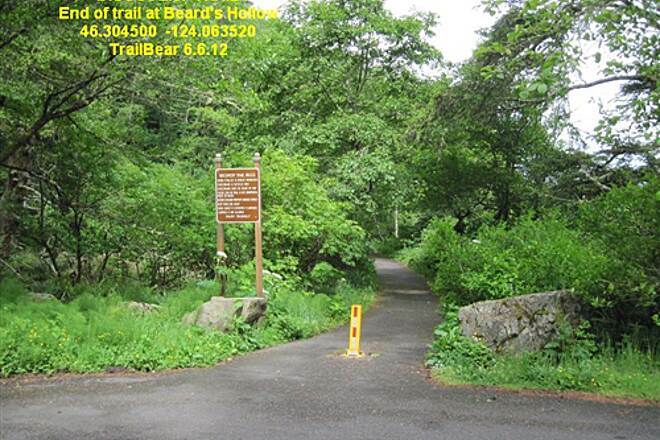 It was named Beard’s Hollow after the late Capt. Beard, wrecked upon this coast. His body was found in the inlet before the dunes formed. At the top of the swamp is a trailhead with parking and a vault toilet. 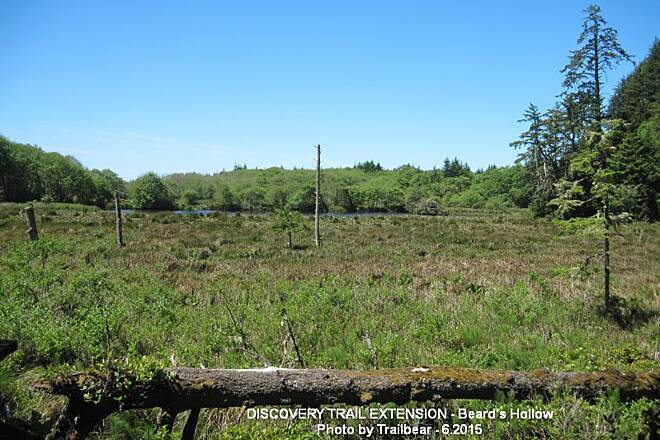 This is state park land so they want a Discovery Pass ($10/day) showing or plan to fine you. Here is the end of the dune ride and a logical turn around point. If you take the bridge overlooking the swamp, you climb up almost to the Beard’s Hollow overlook. Another paved section of the Discovery is waiting across the road there to take you over the hills to Illawaco. This is a steep and twisty bit. Your choice. I turned around here. Time to try the sea of grass with the wind behind. It’s more fun that way. Speed went up from 8 mph to 12, 14, 15 mph. Back to Bolstad and pack up the trike ahead of the rain.